James Young was just 22 years old when he suffered a freak accident at a London underground station. He somehow was pulled under a train, which rendered him armless and legless. Sustaining critical injuries, he severed his left leg below the knee and remained in an induced coma for 12 days until his condition stabilised. With collapsed lungs, a fractured skull, and cracks along his spine, he certainly has been given a new lease on life courtesy the doctors who performed 12 different operations to save his life. But until last year, he still had to wear the ugly pink cast and had to live his life with physical and emotional pain. Now thanks to prosthetics artist Sophie De Oliveira Barata, he is the first person to receive the futuristic prototype bionic arm. 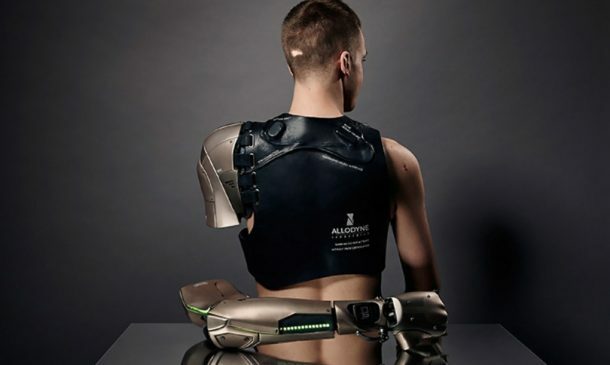 This arm is unique as it utilises state of the art robotics that forms a working connection between the nerves and muscles of the shoulder with the prosthetic’s circuitry. The arm and hand are capable of performing delicate commands that are way beyond the conventional prosthetics. But the prosthetic isn’t just unique in its practicality, it also entails some extra cool high-tech features, that makes it all the more amazing. The project has been created by Sophie De Oliveira Barata, founder of the Alternative Limb Project and the video game studio Konami. 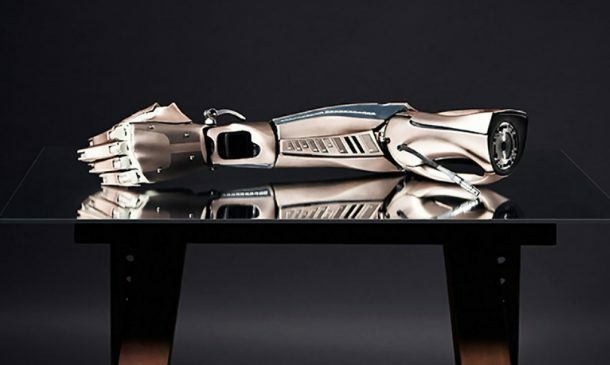 The design and features of the limb are heavily related to the Metal Gear Solid game franchise, and the limb even featured in the most recent episode of the show. The high-tech limb has state of the art sensors that can be used to detect movements in Young’s shoulder muscles and gives him complete control over the battery-powered hand and arm. But it doesn’t end there. 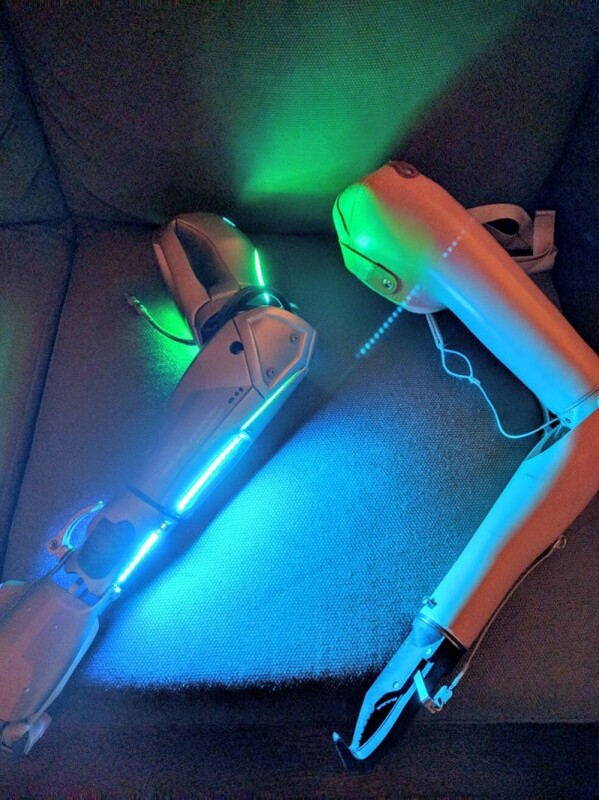 The arm also has an added laser light, a built-in flashlight for navigation in the dark, a USB port to charge his smartphone, and even a small drone that is stored in the shoulder; more or less like a pirate’s parrot! The prosthetic limb and arm still needs a lot of improvement though. For example, they are not water proof, neither shock proof. So Young has to it off when he goes to shower or has to sleep. They also weigh 4.7 kg (10 lbs), which is not very easy to carry around. Young is also unable to wear his leg prosthesis for extended periods due to the pain it causes, and for now, continues to use a wheelchair for his day-to-day activities. We wish Young very best for the future, and may his dream of becoming a cyborg come true soon! Have any other information to add to this article? Let us know in the comments’ section below! Why would someone wear prosthesis in sleep?